EAST CHICAGO, IN. 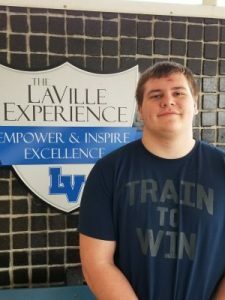 – LaVille’s Alex Cartwright is a Indiana High School Athletic Association Regional Wrestling Champion! Cartwright became the ninth wrestler in school history to earn a regional title. The Lancer senior pinned Oscar Herrera of South Bend Washington in 15-seconds to win the first round match. In the semifinal, Cartwright pinned Hagaen Slusher of Wawasee in 48-seconds to set up a regional title match with Penn’s Yehezquel Devault. And it was a fantastic match! Both Webb and Cartwright knew facing the #1-ranked wrestler in the 285-pound in Indiana would be a great test. A measuring stick, if you will. Admission will be $8 (Final session only) or $10 (Season ticket). The top four place winners in each weight class advance to the state finals. *A loss in either the first round or the quarterfinal round would be elimination. Advancement to the semifinals or championship would be advancement to the state finals.